The suction cup lifter features a single stroke pump action for convenience, durable aluminum handles and an impact-resistant housing to withstand work site abuse. No chemicals or other toxic material are used in this process,it is 100% environmental friendly. 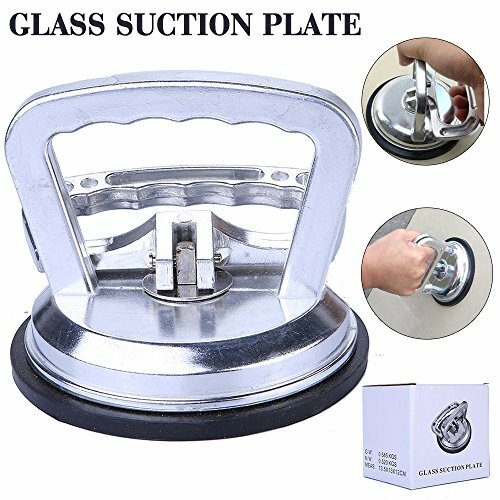 This handle suction cup lifter is a great dent puller as well as the ideal tool for moving flat objects in any home garage or professional body shop! PERFECT DESIGN - The handy suction cup lifter features a single stroke pump action for convenience, durable aluminum handles and an impact-resistant housing to withstand work site abuse. WIDE APPLICATION - This handy Silver Aluminum suction cup lifter is a great dent puller as well as the ideal tool for moving flat objects in any home garage or professional body shop! SPECIAL MATERIAL AND SIZE - It is made of aluminum and12 cm/ 4.7 inches suction cup diameter. It is applied good performance and can be applied durable. SO EASY OPERATION - Everybody can make dent removal after take little time learn the dent repair process, DIY in anytime & anywhere. ENVIRONMENT FRIEBDLY - No chemicals or other toxic material are used in this process. it is 100% environmental friendly. If you have any questions about this product by chengyang, contact us by completing and submitting the form below. If you are looking for a specif part number, please include it with your message.